Liquid Health Daily Multiple Description: Whole Food Nutritional Supplement from Sea Vegetation. Gluten free. Superior Absorption. Vitamins and Minerals. Amino Acids. ACTIValoe. 4 Week Supply. 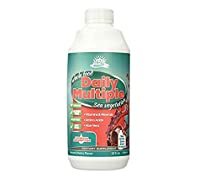 Daily Multiple is an amazing blend of whole foods designed to provide the vitamins, minerals, trace minerals, and amino acids your body deserves. The base of pure aloe vera juice is loaded with digestive enzymes, and Eleuthero packs an energetic punch. Sea vegetables – dubbed nature’s perfect food – provide most of the nutrient in this well-rounded formula. Honey is an excellent sweetener, known for its energizing effects and b-complex vitamins. Our Aloe Vera juice is cold-pressed, leaving the nutrients intact and the enzymes active. Because Daily Multiple is a whole food and liquid, there is no product with a higher absorption rate. If you are a person who has problems with supplements disagreeing with your system, you may find the whole food qualities of Daily Multiple to be what you need. Free of Starch, salt, wheat, gluten yeast, milk and soy derivatives. Disclaimer: These statements have not been evaluated by the FDA. These products are not intended to diagnose, treat, cure, or prevent any disease.